There are more silver holos on the market than there are old-enough-to-know-better 1D fans on twitter but Dodgy Barnett is different. This particular holo-infused polish blurs the lines between silver and grey, leaning more to the understated sophistication of a cool-toned grey than the usual bling of a silver holo. Dodgy Barnett sparkles a multitude of rainbow colours but ultimately keeps that wispy, pastelly grey thing going on… perfect if you’re looking for something sophisticated but with a little something different to show off about! 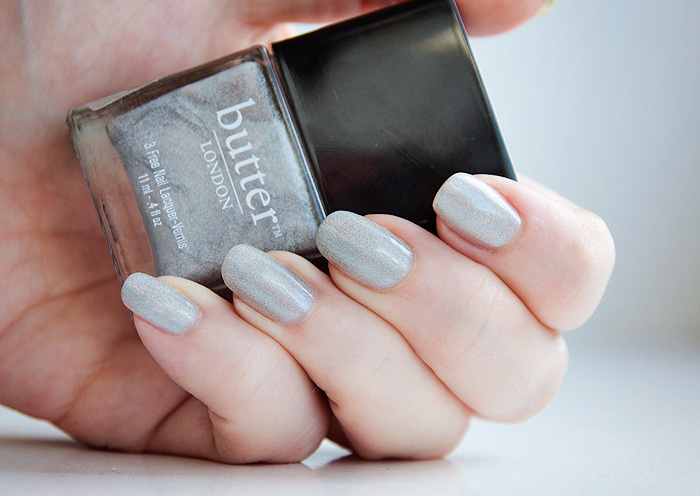 Butter London’s Dodgy Barnett is priced at £11.95 and available to buy online at PowderRooms.com who are offering 25% off all Butter London products with the code “butter”. But hurry, today’s the last day to take advantage of the promotion.